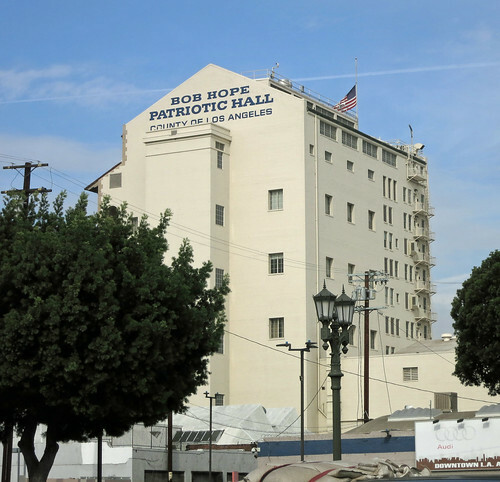 I went on a tour of Bob Hope Patriotic Hall, which is that building that sort of sticks out and up, south of the 10 near the 110 interchange. It's just for veterans. It hosts several veterans groups and provides space for organizations providing services to veterans. So, it's not a museum, but there are photos on display and some historical artifacts. Most of those are behind glass, which makes for bad photography. This is the place that sort of stands out, south of the 10, near the interchange with the 110. 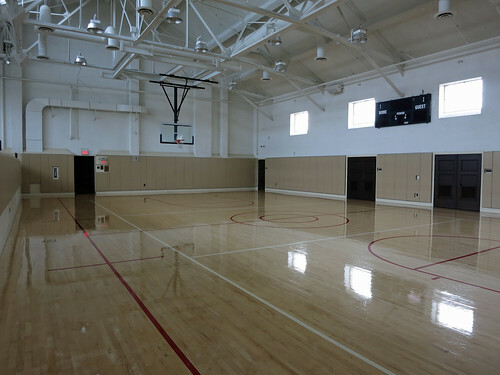 On the top floor, under the peaked roof is this basketball court. We were told this court was using in the filming of Hoosiers. 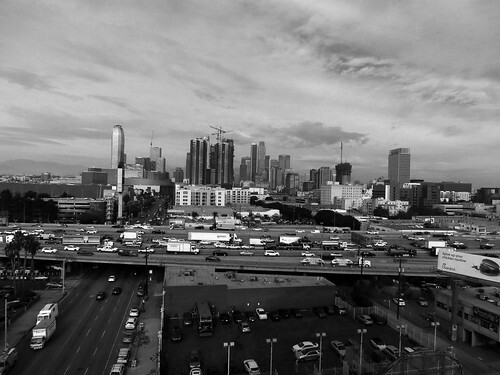 The 8th floor has this balcony with a view to the west. Just open the door and step out. I am unaware of any restrictions. You go through screening when you enter the building. Take the elevator up to the 8th floor and there you are. 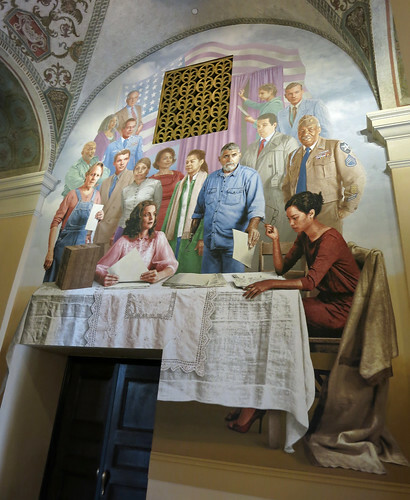 One-third of a triptych in the lobby depicts a diverse group of Americans at a polling place. I call it "The GOP's Nightmare." 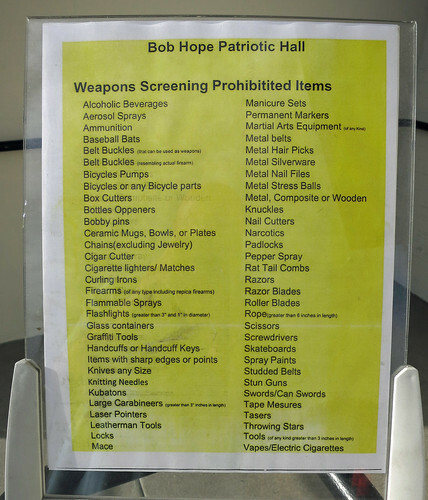 This list of verboten items is longer than TSA's. It's more appropriate for a jail or courthouse—or a public school. The view north from Bob Hope Patriotic Hall. 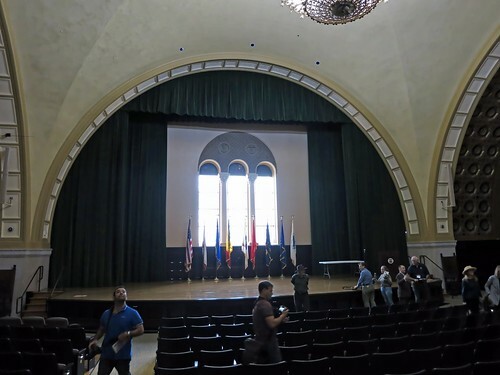 We were told that this hall is the location where the opening scene of Patton was filmed. And here was the most unusual thing of the day: on the tour was a woman whose grandfather's portrait was on display on the 8th floor. She had discovered that entirely by accident while watching TV. 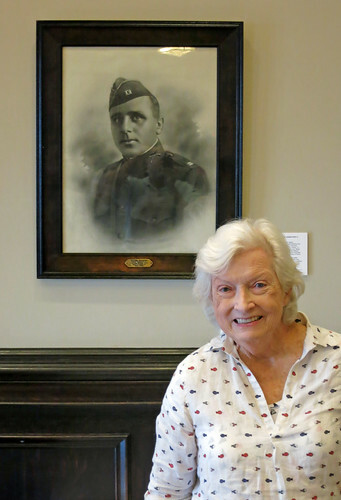 This tour was the first time she had seen the actual portrait. Her grandfather's name was Walter Brinkop. 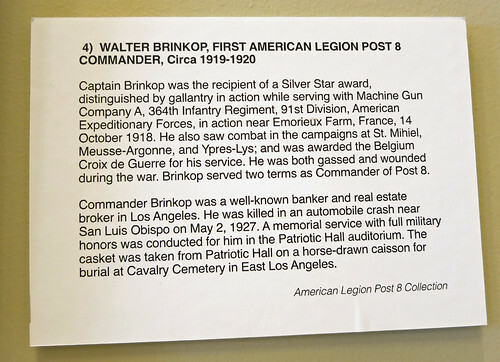 He was the first commander of American Legion Post 8, which was the 8th post in the U.S. and the first in Los Angeles.